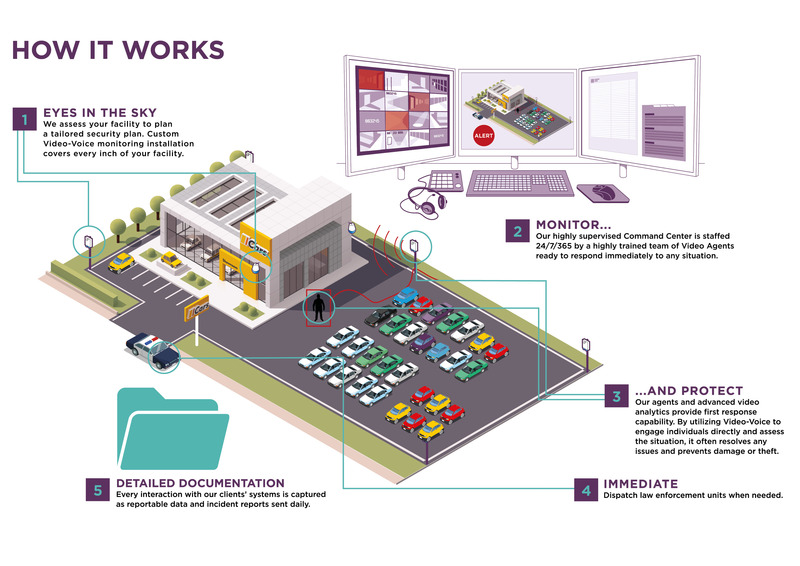 Viewpoint has a proven track record of unparalleled success in protecting auto dealers and storage lots from theft, vandalism, and other unwanted activity. Our zero-tolerance security strategies ensure that key areas such as inventory lots, drop-zones, service bays parts and showrooms are always secure. We protect against both internal and external threats all while improving safety and operational efficiency of staff. As with any industry sector we first collaborate with the automotive client to understand their challenges. We then determine the best equipment and strategy for a zero-tolerance security system. In the automotive sector we’ve monitored and protected a wide range of businesses from dealerships to storage lots across North America. Using intelligent video systems, audio and state-of-the-art video analytics, Viewpoint can protect any site from intrusion, theft, damage and investigate thoroughly any time a person or vehicle enters the property in real-time. We can also offer protection for locations where expected activity, such as service drop-offs, parts delivery, cleaning crews and after hours visitors are common. While Viewpoint can work with your existing camera system, we also specialize in the design and deployment of robust, cutting edge video-voice systems that take advantage of the latest technologies best suited to the client’s specific needs. With a sophisticated network of installers, Viewpoint can create turn-key solutions to work with any budget and our customers are able realize tangible savings and R.O.I when compared with more traditional security strategies.